Gordon Wadsworth and Andrew Dunlap pause to take in a wild view of Roanoke from the Mill Mountain Lookout. Being minutes from town, Mill Mountain is the perfect place for a quick ride—although epic double rainbow views can’t always be expected. The city of Roanoke’s water manager, Kit Kiser, had a trail named after him, and that was not a compliment. He didn’t even like mountain bikers. Yet, on a summer day in 1997, he sat in a 4x4 with two trail-poaching riders, taking a tour of the forest surrounding Virginia’s Carvins Cove. The path to the 4x4 ride had been building for years. It started when Kiser opened the Cove’s reservoir to motorboats, but publicly denied mountain bike access. Feeling unjustifiably pushed out of the area, renegade riders snuck into the Cove throughout the 1990s to build trails with names like “Kit and Caboodle.” All the while, the Roanoke riders passed around hand-drawn maps, relishing in the obscurity of their rides while also keeping lookout for Kiser’s enforcement crew. Wes Best was one of the riders in the 4x4 with Kiser; he was also one of the renegades. That morning Best had swapped his Grateful Dead shirt for a bike jersey, preparing for a nerve-racking drive with his adversary. 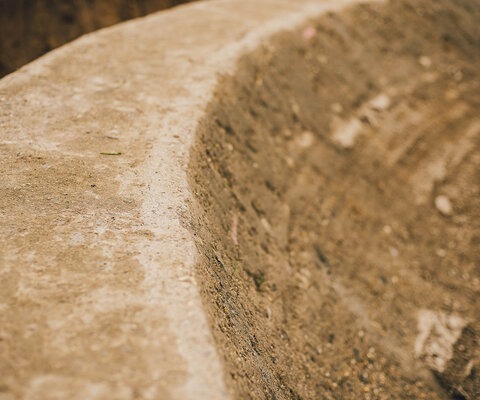 Prior to this showdown, Best and riding buddy Ian Webb had grown tired of hauling in saws simply to maintain the trails while avoiding the watchful eye of the water manager. Motivated to take action, the duo convinced the city to consider the possibility of making the property public—which led to the backseat of a 4x4, a water-enforcement officer at the wheel and the water manager himself sitting shotgun. In the backseat also sat Rupert Cutler, the director of the Western Virginia Land Trust and former member of President Jimmy Carter’s administration. Partway through the tour, Cutler told them to stop the vehicle. 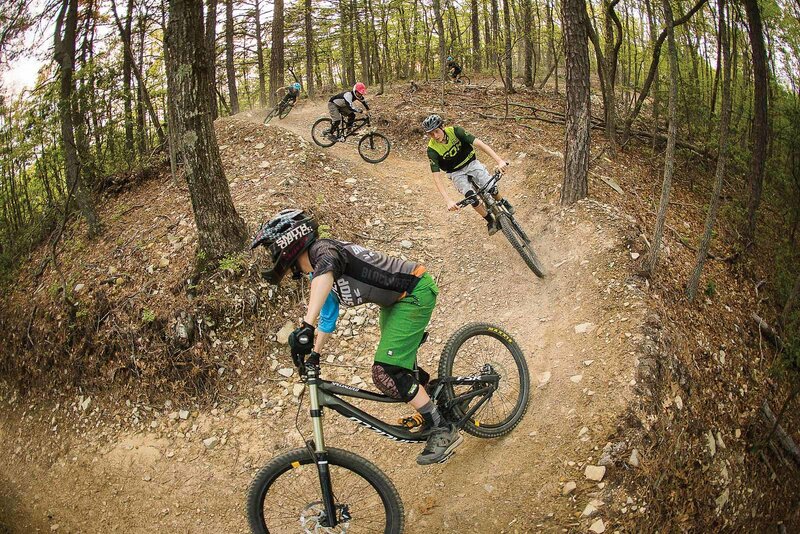 Carvins Cove is Roanoke’s original riding network, and it took a decade of rogue trail work before it finally became a nature reserve in 2000. Ron Glowczynski blasts through a stream while riding some of Virginia’s most iconic singletrack. Then came the diesel engines of the 1950s, which quickly replaced steam engines—and, when factories closed as a result, thousands of workers were left unemployed. As the 1990s ended, the city was a ghost of its former glory. By the time Best began his work on the citizens’ committee in 1997, a mere 15 people officially lived downtown. Vacant stores lined the streets, and restaurants were nonexistent. Unsurprisingly, the city’s mountain bike scene was similarly vacant. 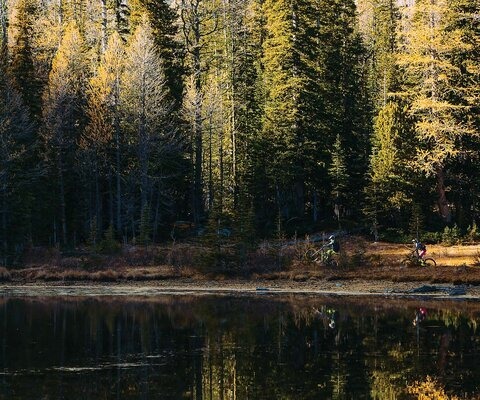 Yet, as stagnant as the city was, an unlikely mountain bike community began to emerge there. In 1992, local competitive cyclist Kyle Inman promoted a race on the jagged spines of nearby Dragon’s Back ridge. At the time, it was just a fun event, but, for future riders, it would become the bedrock of Virginia’s mountain bike race culture. Inman remained at the forefront of this movement, setting up races like Rowdy Dawg, Dante’s Inferno and Middle Mountain Mamma. Part masochistic pedaling, part party in the woods, the events’ reputation spread to racers up and down the Eastern Seaboard. Soon local all-stars were battling national professionals like Chris Scott, Sue George and Jeremiah Bishop. Some came just to enjoy the party; others came to survive 30 miles of suffering. The race series grew to include the self-proclaimed Virginia State Championships, which attracted more than 300 riders. National support flowed in, with sponsorships from the likes of Dirt Rag Magazine. 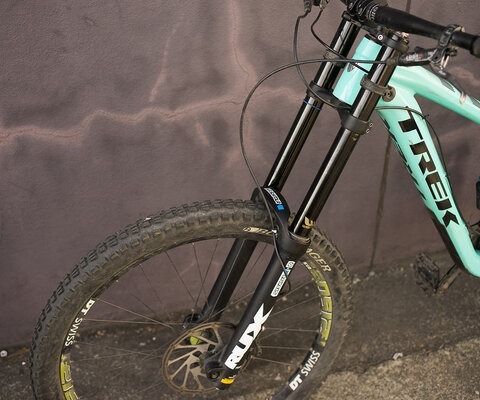 The now-defunct National Off Road Bicycle Association even hosted a regional championship on the area’s rocky, technical trails. 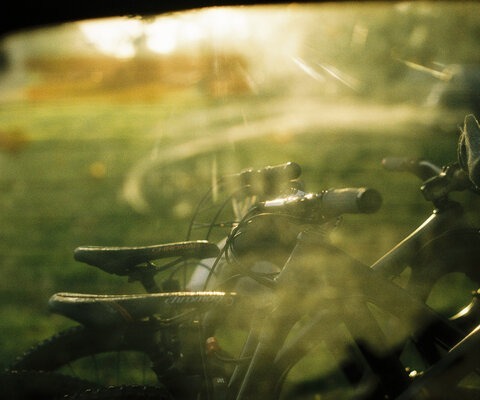 Then in 1997, Inman was approached by the American Mountain Bike Challenge about hosting their event. He suggested Carvins Cove, but when he tried to get the city to sign off, they responded with an emphatic negative. A few days later, the local paper ran a front-page story titled “No Racing at the Cove,” and with that the battle for Carvins began. 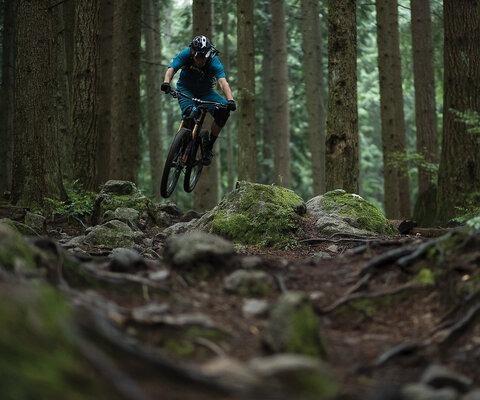 Glenwood Horse Trail is a ride just north of town, a mix of double and singletrack that provides some loose and rocky contrast to some of the area’s mellower riding. Gordon Wadsworth and Emily Hairfield enjoy the sunshine and early signs of spring. Drawing off this enthusiasm, a coalition of user groups—including bikers, hikers and equestrians—approached the county about turning the Cove into a park. The result was a citizens’ advisory committee, tasked with the development of Carvins as a public space. Best, who sat in on many of the early meetings with the county, realized the next step forward wasn’t racing. It was development of the trails themselves. 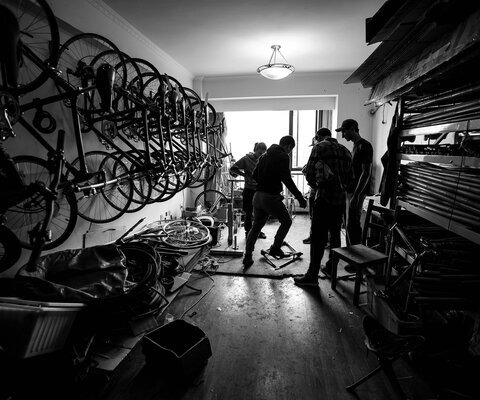 While working as shop manager at East Coasters Bike Shop, Best was selected as one of seven advisory committee members. Looking for help, he recruited Webb to serve as well. It was a key appointment, as the rest of the committee was indifferent to the designation of Carvins as a park and would potentially block a vote to do so. 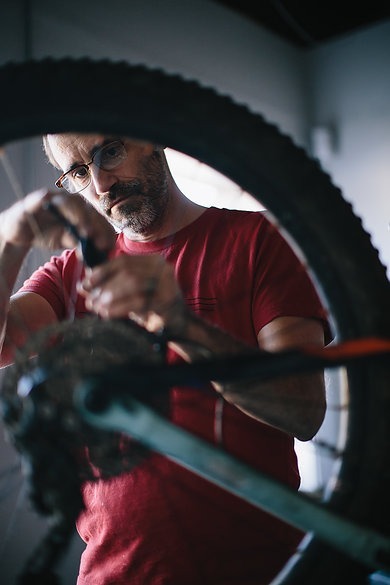 Wes Best has been a mountain bike pioneer in Roanoke since the beginning, and these days he keeps the legacy alive as owner of East Coasters bike shop. More assistance came in the form of Mike Matzuk, owner of East Coasters, an outspoken advocate of volunteerism, and Best’s boss, who allowed Best to adjust his schedule around the committee’s planning meetings. And the committee had a lot of meetings—two-and-a-half years’ worth of them, to be exact. The city hired a consultant team to document flora and fauna at the Cove, and the committee made sure to include the concerns of hikers and equestrians. Best and Web brought in IMBA’s Trail Care Crew to educate committee members about sustainable trail design and rider impact. In the end, the work turned out to be worth it. When the vote to create Carvins Cove Nature Reserve came to the table in 2000, it was approved unanimously. “Yes-mentum” had been achieved. The newly minted reserve became the nation’s second largest managed by a city, and dozens of miles of now-legal trails already crawled along nearby ridges and valleys. But more work needed to be done. Best continued to manage East Coasters, and in 2005 he and a business partner bought the shop. One of Best’s early hires was a kid named Gordon Wadsworth. 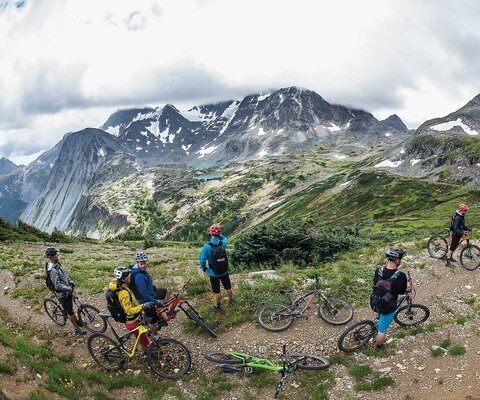 The 14-year-old redhead soaked up the bike scene around him, and eventually joined the area’s veteran riders at races and 100-mile backcountry rides. Soon he wasn’t just riding along with the adults; he was crushing them. Under the mentorship of the Roanoke bike community, Wadsworth excelled in competitions, particularly on the single-speed race circut. As the victories stacked up, the newly nicknamed “Quadsworth” eventually became known as the fastest single-speeder in the world. Now married, he and wife Emily loved the Roanoke bike community, but the town itself continued to struggle, which only worsened with the Great Recession of 2008. In 2014, Wadsworth and Emily moved to Cumberland Gap, KY, where Emily studied to be a physician associate. They left behind a hometown beset by an identity crisis. 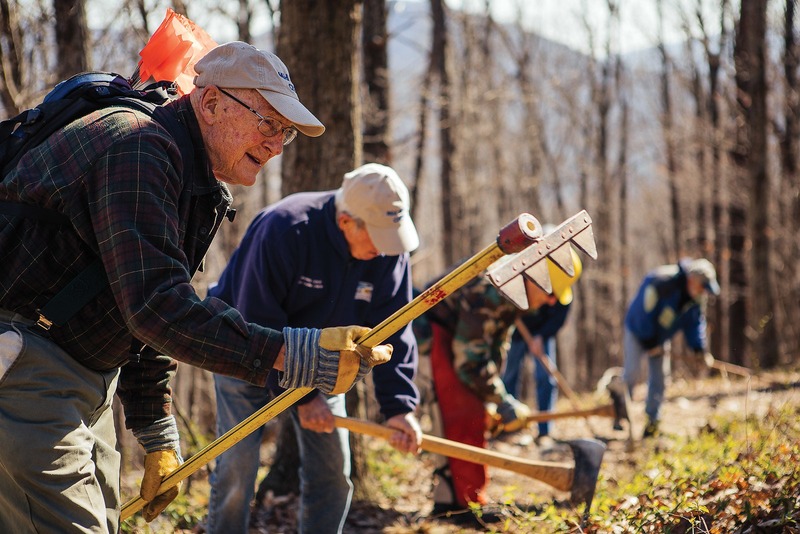 With an average member age of 75 and a 25-year legacy of working on the Appalachian Trail, few Roanoke locals have put more time in than the Mid-week Crew. Government and business leadership were asking themselves that same question. Roanoke needed a new story, and the most promising narrative came in the form of the area’s outdoor assets; the trails, lakes and forests that had excited Cutler over a decade before. 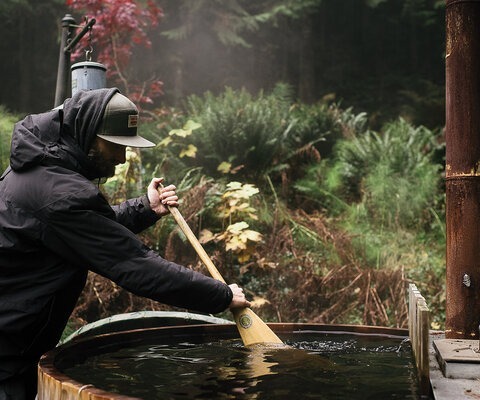 The community just needed someone to connect the dots, and that person was outdoor industry veteran Pete Eshelman. Eshelman—whose resume included organizing the Blue Ridge Marathon, aka “America’s Toughest Road Marathon,” and founding Roanoke’s IMBA chapter—took the wheel of the newly formed Roanoke Outside Foundation. The foundation began as an arm of a public/private partnership to develop the local economy, and Eshelman’s task was branding the outdoors. It was a role that allowed him to extol Roanoke’s outdoor opportunities, with a particular focus on educating the government as to the economic impact of the associated industry. He centered his efforts on one broad claim: “Roanoke, the Mountain Bike Capital of the East.” For local riders, it sounded suspiciously like the hyperbole of a public relations stunt. For the city, however, it was a call to action. Within a few months Renee Lavin Powers was hired as outdoor recreation supervisor, and immediately began assembling a crew of volunteers. The idea was to find the existing trails, post signage and create access from parking lots and greenway connections. As these efforts came to fruition, new trails were going in at an unprecedented pace, with volunteers clocking 4,000 hours of trail work in a single year. “There were so many projects going on it was hard to keep up with,” Best says. For one group, the Mid-Week Crew of the Pathfinders for Greenways, this was just a continuation of the 25 years they’d already spent working on the Appalachian Trail. Led by Dr. Bill Gordge, the average age of the crew is 75, and they are locally famous for their precisely graded dips and rugged rock armoring. Another group, the Weekend Crew led by Brian Batteiger, has put in a decade of work as well, and has a resume that includes designing and building the flow trail Rock-N-Roll at Carvins. The city of Roanoke’s outdoor reputation may be new, but the community behind that legacy is anything but. 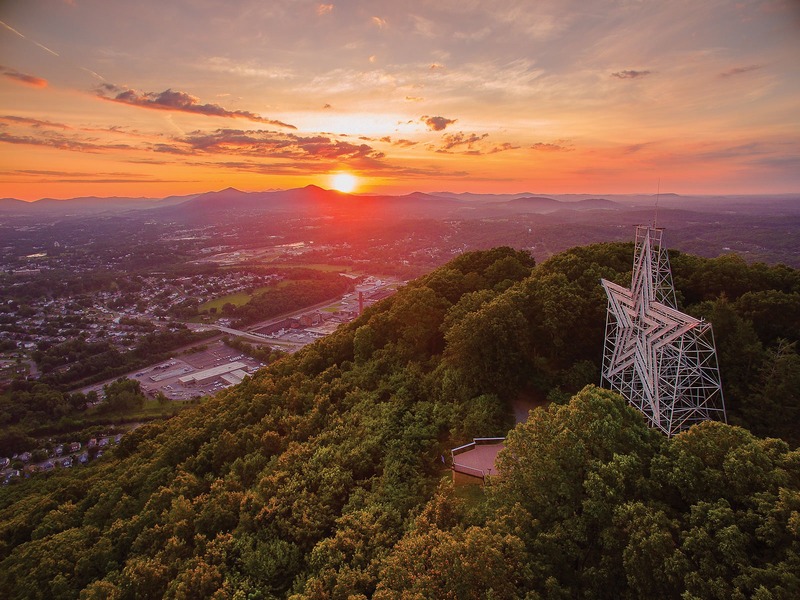 Constructed in 1949 as a Christmas decoration, the star on Mill Mountain has since become Roanoke’s most recognizable icon. Ten-thousand pounds of steel and 2,000 feet of neon tubing can do that. Mill Mountain rises 800 feet out of the valley floor, providing a bulky backdrop for Roanoke’s modest brick and stone downtown skyline. The Roanoke River snakes lazily past the foot of the heavily forested ridge, separating it from the city’s center. Just upriver is a complex of the railroad switching yard. 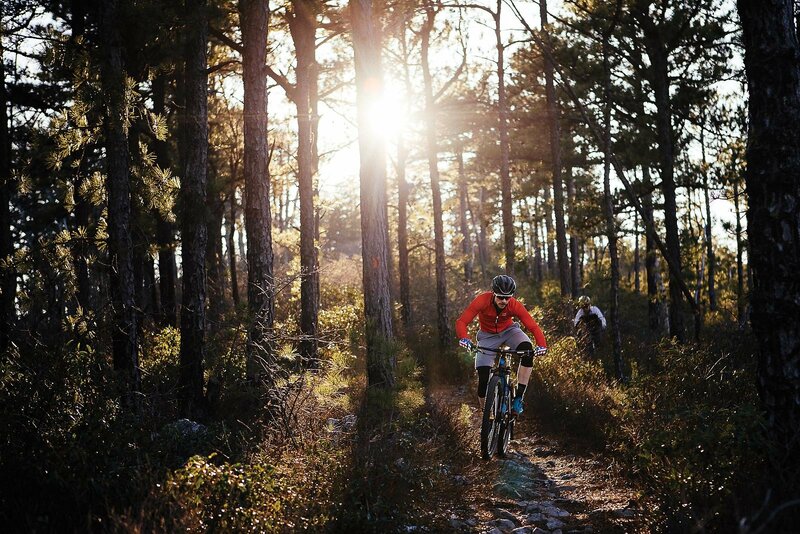 It’s one remnant of Norfolk and Western’s “Magic City.” In a boon for future mountain bikers, Mill Mountain is an another. In the early 1900s, Norfolk and Western purchased the land on Mill Mountain, but rather than log the area, the rail line made it into an urban getaway for their workers. This saved the area from clear-cutting, and meant that when the city erected a neon, 88.5-foot-tall star at the top during the 1949 holiday shopping season, it became an immediate tourist attraction. The trail to the star has always been popular. It has also always been officially closed to bikes. Still recovering from his efforts at Carvins Cove, Best watched as the city transformed that trail system, giving it destination-quality status. But his attention was aimed closer to home: at Mill Mountain, where he saw the opportunity to create an in-town park. It would be a place where bikers could ride during their lunch breaks or after work, and would physically tie the city itself to what was quickly becoming part of its identity. Taking a cue from the previous owners of East Coasters, Best offered his employees flex time if they would help with work on Mill Mountain. The shop workers walked the trails, mapping the system by hand while assessing trail conditions and noting maintenance needs. It was a thorough effort, and when Best approached the city with his proposal, it was quickly approved. But to tell Roanoke’s story to the larger world, the city needed an outlet—so Eshelman created RoanokeOutside.com, a website compiling maps, trail information, and photos and videos of all the area’s land and water-based activities. Soon tales of incredible riding and a flourishing bike scene spread up and down the Eastern Seaboard. To prove these weren’t just rumors, Eshelman pushed for an official celebration of all things outdoors in Roanoke. The resulting event, the three-day Go Outside Festival, brought the vigor of Virginia’s bike scene to the city’s streets. The annual event sees local IMBA chapter members pouring beer, while a lineup of BMX races, lumberjack demos, silent discos and tent races show visitors what Roanoke has to offer. “It’s probably one of the things of which I’m most proud,” Eshelman says. Kelly Hazlegrove leads the charge into the berms on Old Gauntlet, a classic flow trail at Carvins Cove. 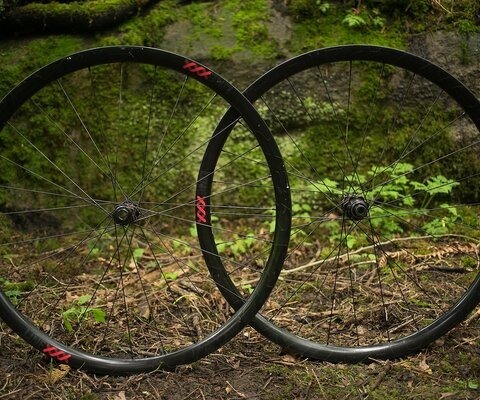 That was enough to convince Deschutes, and a multitude of tech and outdoor companies soon followed. Some businesses even used local trail systems in their marketing campaigns to entice potential employees. During a Wednesday evening in May, two decades after the nervous 4x4 ride with Kiser, Best puts on a leisure suit before getting on his bike. 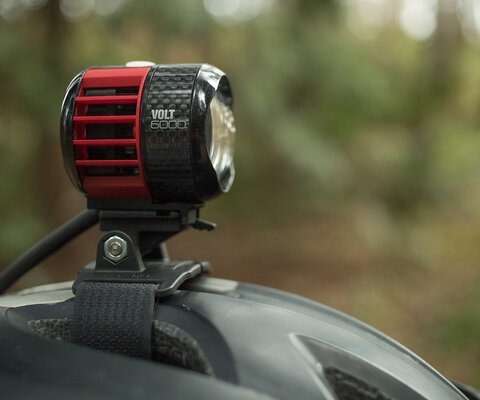 As he rides toward Mill Mountain, his companion is local endurance race promoter Rob Issem, who blasts Kool and the Gang out of a boombox bungeed to his fully rigid Mongoose. The duo arrives at the Discovery Center at the base of Mill Mountain, where they meet a polyester-and-wig-clad Eshelman and a mustachioed Wadsworth. For the evening, the Discovery Center has been dubbed the “Disco Center,” and is the starting point of the weekly Disco Mountain Bike Race. Alongside the world-champion single-speeder, the godfather of Virginia mountain biking, and Roanoke’s main outdoor evangelical, is a wide assortment of costumes and ability levels. 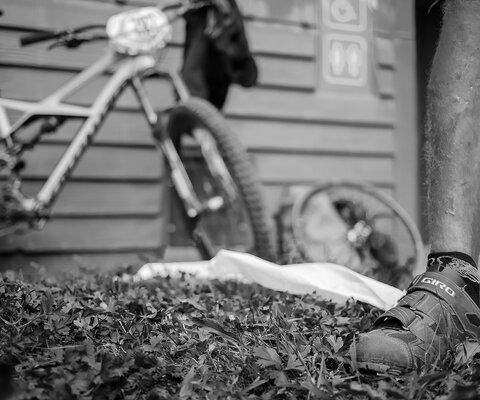 One kid had just purchased his bike that morning, the first mountain bike he’s ever owned. A few hundred feet above the parking lot, the Mill Mountain star shines as it has for the past 70 years. It’s the most prominent symbol of Roanoke’s long history. The crowd at the Discovery Center represents the city’s future.